To Cite: Hatami H, Montazeri S A, Hashemi N, Ramezani Tehrani F. Optimal Cutoff Points for Anthropometric Variables to Predict Insulin Resistance in Polycystic Ovary Syndrome, Int J Endocrinol Metab. 2017 ; 15(4):e12353. doi: 10.5812/ijem.12353. Background: Insulin resistance (IR) is a major cardiometabolic risk factor in females with polycystic ovary syndrome (PCOS). The euglycemic clamp is the gold standard method to measure IR. However, considering the time and cost that it takes, surrogate markers of IR are now widely used. The current study aimed at evaluating the cutoff points of even less invasive anthropometric and body composition variables to predict IR in females with PCOS. Methods: The current cross sectional study selected 224 females with PCOS, using Rotterdam criteria, referred to reproductive endocrinology research center; 88 of which were diagnosed with insulin resistance. Receiver operating characteristics curve was used to explore the best cutoff values of each anthropometric and body composition measures. IR was defined as homeostasis model assessment formula greater or equal to 2.6: HOMA-IR = fasting insulin (mU/L) × fasting plasma glucose (mM/L)/22.5. Results: The highest area under the curve (0.751) was for the multiplication of waist circumference (WC) by body mass index (BMI), as a single index. The highest sensitivity and specificity were for body water (BW) percentage (82% for values greater than 32.85%) and WC (79% for values greater than 88 cm), respectively. Conclusions: It was concluded that there were simple anthropometric variables; e.g., WC × BMI, percentage of BW, and WC that could help to estimate IR in clinical settings especially when the gold standard or surrogate markers of IR were unavailable. Copyright © 2017, International Journal of Endocrinology and Metabolism. This is an open-access article distributed under the terms of the Creative Commons Attribution-NonCommercial 4.0 International License (http://creativecommons.org/licenses/by-nc/4.0/) which permits copy and redistribute the material just in noncommercial usages, provided the original work is properly cited. Insulin resistance (IR) is a result of various disturbances in insulin secretion in pancreas, glucose metabolism in liver, or signaling receptors in various tissues. IR may contribute to cardiovascular diseases via several pathologies: endothelial or vascular dysfunction, sympathetic hyperactivity, impaired signaling pathways or receptors, reduced lipolysis, and elevated blood pressure (1). IR, regardless of obesity status, puts females with the most common endocrine disorder in reproductive ages i.e., polycystic ovary syndrome (PCOS) at greater risk for cardiometabolic consequences than the ones without PCOS (1, 2). Also, females with PCOS had different cardiometabolic risk factors in the population-based studies than the ones retrieved clinically, as the latter females had more profound signs and symptoms of the disease (3-6). Therefore, the early diagnose of IR in females with PCOS is of great importance. The gold standard method to detect IR is the euglycemic clamp technique (7). As it is more time-consuming and expensive than surrogate markers of IR, the latter methods are now widely used instead. For instance, fasting insulin (a limited marker due to high false-positive rate and lack of standardization), glucose/insulin ratio, which does not truly reflect the underlying components of IR, insulinogenic index, which is not widely validated or used, and homeostasis model assessment (HOMA), which has a linear correlation with the gold standard method and is extensively used, are such markers used to estimate IR on behalf of the gold standard method (8). Several efforts are made to introduce less invasive markers such as waist circumference (WC), body mass index (BMI), and waist-to-hip and -height ratios (WHR and WHtR, respectively) etc., to explore IR in different studies (9-19). However, the shortage of population-based studies that results in selection bias and recruiting females with advanced disease rather than among the general population may affect the cutoff values of related anthropometric measures. Hence, a population-based study might address these shortcomings more appropriately. 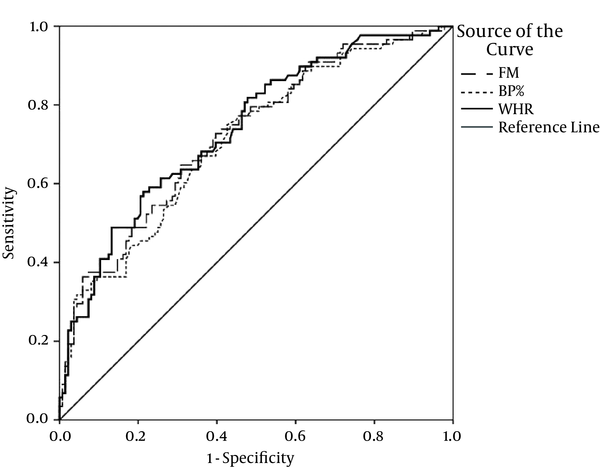 The current study aimed at exploring the anthropometric indices to precisely predict IR in females with polycystic ovary syndrome in a community-based design. A total of 224 females of reproductive age, referred to reproductive endocrinology research center with PCOS diagnosis, who met the inclusion criteria were recruited for the current study. A standard questionnaire including demographic and reproductive data was used, which focused on menstruation regularity, gynecological diseases, hyperandrogenism symptoms, family history of dysmenorrhea, and hirsutism. Hirsutism was assessed by a gynecologist. Ovulatory dysfunction was defined using information on time intervals, cyclicity and total number of menstrual cycles per year. In the current study, menopausal females, the ones pregnant at the time of the evaluation, females with either hyperprolactinemia or thyroid dysfunction, females with only androgen excess, the ones only with ovulatory dysfunction, and females with only polycystic ovarian morphology were excluded. Participants’ weights were measured with a digital scale when they had minimal clothes, then rounded to the nearest 0.1 kilograms. Heights were measured without shoes on standing position with normal posture of shoulders using a tape meter. Similarly, WC was measured at the umbilical level without any pressure to the body surface. Both records were rounded to the nearest 0.5 cm. Hip and wrist circumferences were also measured. After 15 minutes of rest, blood pressure was measured twice in a seating position on the right arm. The mean of these measurements was considered as the participant’s blood pressure. Venous blood samples were taken after a 12-hour fasting from 7:00 to 9:00 A.M. on the 2nd or 3rd day of spontaneous or progesterone-induced menstruation. All samples were drained into ethylenediaminetetraacetic acid (EDTA) tubes and kept at -80°C after being centrifuged at 1560 g for 10 minutes. All the subjects underwent transvaginal or transabdominal ultrasonography of the ovaries using 3.5-MHz transabdominal or 5-MHz transvaginal transducers, respectively. Ultrasound was performed on the same day that blood samples were collected. All ultrasonography data were evaluated by the same expert sonologist. Fasting plasma glucose was measured using glucose oxidase method (Glucose kit; Pars Azmun, Tehran, Iran) while both the inter- and intra-assay coefficients of variation were 2.2%. Serum insulin level was measured using immunoradiometric assay (IRMA) (Mercodia, Uppsala, Sweden, covariance < 4%). Body composition of all study subjects was assessed using Bodystat® 1500 Body Manager (serial no. 310110). Body fat (BF%), body water (BW%), lean body (BL%), wellness marker, and basal metabolism rate were measured. A trained technician did all scans according to the manufacturer’s guidelines. In a non-invasive and feasible process, the device was connected to the subject while wearing minimal clothes. Then, a safe signal originated from the battery was sent through the body and bioelectrical impedance was measured at a fixed frequency of 50 kHz. The details of the measurement were, then, displayed within seconds. Based on the Rotterdam criteria, PCOS was diagnosed as the presence of at least 2 out of 3 of the following: oligo/anovulation, hyperandrogenism, or polycystic ovaries after excluding hyperprolactinemia, thyroid dysfunction, and non-classic 21-hydroxylase deficiency (20). Anthropometric risk index (25) was calculated based on the criteria presented in Table 1. Abbreviations: BF%, Body Fat Percentage; BMI, Body Mass Index; WC, Waist Circumference; WHR, Waist-to-Hip Ratio; WHtR, Waist-to-Height Ratio. All analyses were conducted using IBM SPSS Statistics version 20.0 for Mac and P value < 0.05 was the statistical significance level. Continuous variables were checked for normal distribution by the Kolmogorov-Smirnov test and expressed as mean ± standard deviation (SD) or median (interquartile range 25 to 75) based on normal or skewed distribution. Receiver operating characteristics curve analysis was used to evaluate the ability of each variable to predict insulin resistance. Then, the area under the curve (AUC) of insulin resistance (i.e., HOMA-IR ≥ 2.6) was drawn for each anthropometric and body composition variable. The cutoff value of each anthropometric or body composition variable was the spot in the ROC curve with the maximum of this formula: (26): (1-sensitivity)2 + (1-specificity)2. Then, sensitivity, specificity, positive predictive value (PPV), negative predictive value (NPV), and likelihood ratios (LRs) of every cutoff value were calculated using abovementioned formulae. The Medical ethics committee of the research institute for endocrine Sciences, Iran, approved the study protocol. Informed written consents were obtained from all subjects prior to the study. Table 2 shows baseline characteristics in females with PCOS, with or without insulin resistance. The baseline values of age, height, systolic and diastolic blood pressure, and a body shape index (ABSI) did not differ significantly between the 2 groups (P > 0.05). Other anthropometric and laboratory variables; e.g., weight, WC, wrist or hip circumference, BMI, WHR, WHtR, weight-to-wrist ratio, fasting plasma glucose, BF%, BW%, BL%, basal metabolism, and activity metabolism were higher in patients with IR than in others (P < 0.001). Abbreviations: ABSI, A Body Shape Index; BAI, Body Adiposity Index; BMI, Body Mass Index; BRI, Body Roundness Index; DBP, Diastolic Blood Pressure; FPG, Fasting Plasma Glucose; HC, Hip Circumference; IR, Insulin Resistance; PCOS, Polycystic Ovary Syndrome; SBP, Systolic Blood Pressure; WC, Waist Circumference; WHR, Waist-to-Hip Ratio; WHtR, Waist-to-Height Ratio; WrC, Wrist Circumference. aData are expressed as mean (SD). bTwo-sided P value calculated from independent t test. Table 3 illustrates the area under the curve for each variable to define ability of each variable to predict IR. According to this WC WC × BMI (0.751) and height (0.581) had the highest and lowest values, respectively. Abbreviations: ABSI, A Body Shape Index; ARI, Anthropometric Risk Index; BAI, Body Adiposity Index; BMI, Body Mass Index; BRI, Body Roundness Index; CI, Confidence Interval; DBP, Diastolic Blood Pressure; HC, Hip Circumference; PCOS, Polycystic Ovary Syndrome; SBP, Systolic Blood Pressure; SE, Standard Error; WC, Waist Circumference; WHR, Waist-to-Hip Ratio; WHtR, Waist-to-Height Ratio; WrC, Wrist Circumference; WWR, Waist-to-Wrist Ratio. To explore sensitivity, specificity, likelihood ratio, positive predictive value, and negative predictive value, Table 4 provides results based on the minimum of (1-sensitivity)2 + (1-specificity)2 of each variable. Maximum and minimum values of sensitivity belonged to BW (82%) and WC (50%), respectively. The most specific variable was WC (79%) and the least specific one was height (42%). The highest PPV and NPV were WC (63%) and BW (81%), respectively. The highest positive and lowest negative likelihood ratios belonged to WC (2.66) and BW (0.36%), respectively. Abbreviations: ABSI, A Body Shape Index; ARI, Anthropometric Risk Index; BAI, Body Adiposity Index; BMI, Body Mass Index; BRI, Body Roundness Index; CI, Confidence Interval; DBP, Diastolic Blood Pressure; HC, Hip Circumference; LR, Likelihood Ratio; PCOS, Polycystic Ovary Syndrome; SBP, Systolic Blood Pressure; SE, Standard Error; WC, Waist Circumference; WHR, Waist-to-Hip Ratio; WHtR, Waist-to-Height Ratio; WrC, Wrist Circumference; WWR, Waist-to-Wrist Ratio. Figures 1 and 2 depict the ROC curves for some of the best anthropometric indices to predict insulin resistance in females with PCOS. The current study aimed at assessing the predictive power of anthropometric indices to detect IR, detected by HOMA method, in females with PCOS. The most powerful variable based on AUC of ROC was a combination of 2 anthropometric variables (WC × BMI); they had promising results to predict IR. The most sensitive (82%) anthropometric variable was BW%, with the cutoff point of 32.8%. 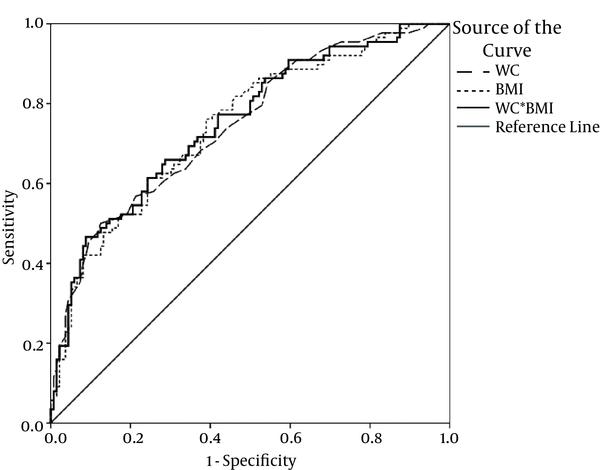 WC (equal or more than 87.5 cm) had the best specificity to detect IR. The highest PPV and NPV belonged to WC (63%) and BW (81%), respectively. IR plays an important and independent role in the pathogenesis of PCOS and in the metabolic consequences of the disease (27, 28). Several mechanisms could contribute to insulin resistant, decreased insulin secretion due to hypo- or inactive beta-cells in endocrine pancreas, impaired hepatic function, and ineffective signaling pathways of the insulin. In females with PCOS, IR could result in further cardiovascular disease via different mechanisms (e.g., sympathetic, endothelial, or vascular problems) (1). Therefore, diagnosis of IR could greatly help the physicians to prevent many of its consequences. Although the gold standard method to measure IR is the euglycemic clamp technique (29), it is expensive and time-consuming. Fortunately, there are highly sensitive and specific surrogate markers widely used to detect insulin sensitivity and IR (8): fasting insulin, glucose/insulin ratio, insulinogenic index, quantitative insulin sensitivity check index, and HOMA; the latter is widely used due to accuracy, safety, and simplicity (7). Several studies assessed various anthropometric indices that predict cardiometabolic risk factors (including IR) and eventually cardiovascular diseases, and related mortality (9). Some reviews concluded that although general obesity variables (weight and BMI) can predict IR, abdominal obesity indicators (WC, WHR, and WHtR) were more powerful predictors for IR (17-19, 30, 31). Similar to systematic reviews, cohort studies, specifically for females with PCOS, were extremely rare. However, there were cohort studies that assessed these indices in other participants. In a cohort of 8-year follow-up, Hadaegh et al., concluded that WHtR was more powerful to predict incidence of cardiovascular diseases than BMI (32). Similar findings were published in a Norwegian cohort (33). An interesting study demonstrated that maternal anthropometric indices such as BMI and WC in pregnant females could even be used to predict metabolic syndrome in their offspring (34). In addition, some other anthropometric indices are introduced. For example, visceral fat area, FMI, ABSI, etc., were useful to detect cardiometabolic risk factors, diabetes, and insulin resistance (35-41). However, other researchers published different results, concluding that these variables might not be superior to common obesity indicators (42, 43). Studies on a more recent index, body roundness index, suggested that although it can predict BF% and visceral adipose tissue (22), it did not add value over more common indices to identify cardiovascular diseases (44). It should be noted that some of these studies might have been influenced by selection bias, as they recruit subjects with more advanced diseases compared with that in general population. Also, various study designs, races, age range (adults vs. children), and adiposity states of the participants could result in different findings. Therefore, one can expect these unavoidable different results. Moreover, the role of other risk factors such as diet, lifestyle, and genetic factors could not be ignored in developing IR (9). Anthropometric indices predicting IR were also evaluated in children: Mueller et al., in a population-based cohort demonstrated that abdominal skinfold thickness in combination with BMI was more powerful than BMI alone to predict IR in pre-pubertal children (10). A cross sectional study by Hirchler et al. showed that WC was slightly more powerful than BMI or WHR to predict IR (12). Moreira et al., and Manios et al., also evaluated BMI, WC, WHtR, BF%, conicity index, and some laboratory parameters to predict IR (11, 45). The current study had its own limitations: first, the study did not use some anthropometric indices including visceral adiposity index, lipid accumulation product, the triglyceride-glucose index, and other measurable fat depositions: trunk, abdomen or android fat, skinfold (biceps, triceps, subscapular) thickness, sagittal diameter, visceral adipose tissue area, brachial or neck circumference, etc. Second, although the study defined IR based on HOMA model as a surrogate marker to overcome the disability to measure it using the euglycemic clamp method, the HOMA-IR closely associated with the gold standard method (7). In spite of these limitations, the study used a comprehensive data set to explore anthropometric indices and body composition measures such as the percentage of body fat, water, lean mass, etc. to predict IR in females with PCOS. Fortunately, as it was an ongoing study, future analyses could improve the knowledge about the predictive power of anthropometric indices to detect IR. In summary, the current study questioned whether an easy and non-invasive method can be used that precisely predicted insulin resistance in polycystic ovary syndrome. Not using even a simple blood sample, some of the indices such as WC × BMI, BF%, BW%, WHtR, etc. with acceptable sensitivity and specificity may predict insulin resistance in females with PCOS. These variables could help females that needed further surveillance for metabolic diseases later in their life. Although cardiometabolic risk factors (especially IR) have on morbidity and mortality in PCOS, further studies are needed to determine the best cost-effective proxy variables, some of which were explored in the current study that can predict insulin resistance even before this condition. This original study was based on a thesis for fulfillment of a Master of Public Health (M.P.H.) degree at the School of Public Health, Shahid Beheshti University of Medical Sciences. Authors would like to thank the staff of the Research Institute for Endocrine Sciences for their valuable time and effort. Authors are also grateful to the unlimited support of the staff of the School of Public Health, Shahid Beheshti University of Medical Sciences. Conflict of Interests: The authors declared no conflict of interest.